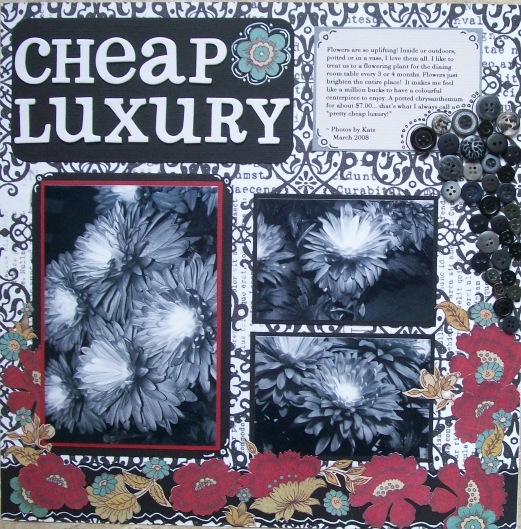 Today we are treated to an article written by artist and Scrapbooker’s Club House Hall of Fame Member Michelle Vekved. Her article suggests innovative yet simple ways to help make our scrap areas more environmentally friendly as we organise. Enjoy, and “Thanks” to Michelle! So, it’s that time again. You’ve been manoeuvering around the unstable piles of paper, books, miscellaneous items and finished projects with no homes, and now you’re sick of it! One more trip and you’re going to go berserk and kung-fu those piles into next week, right? Well. Before you go and join Godzilla on the wanted list, take a few minutes to read these tips and then go through your “junk” and make that room more efficient than ever. And in the meantime, you can reuse some of that “junk” instead of hitting the trash with it! Storing ribbons/rub-ons/packaged items: Screw three screw-eyes in a straight horizontal line on the inside of a door. 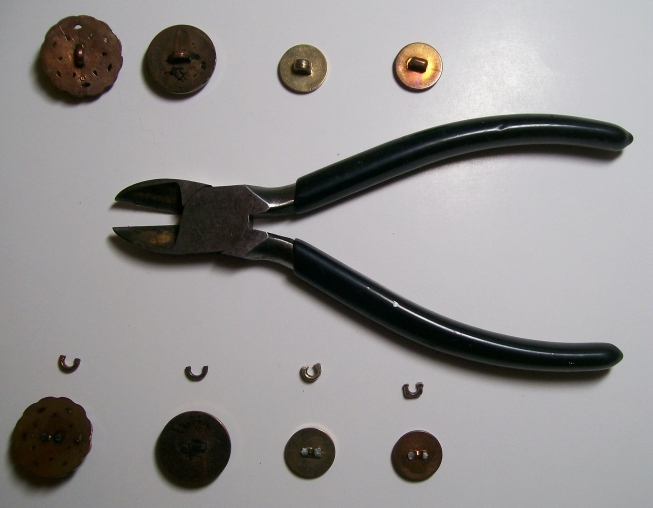 Straighten a coat hanger or use extra heavy florist/craft wire and thread it through the eye-screws. Thread the coat hanger/wire through the springs of as many clothes pins as you like on both sides of the middle eye-screw and then wrap a loop of the coat hanger around each of the end eye-screws. Make sure your clothespins are all facing down before you attach the ends of the wires. Hang your rub-ons/ribbons/packages neatly on the clothespins. A tiered shelving unit: Take advantage of deep shelving when storing small items. Use some empty boxes that are the same height and width (picture those long wooden building blocks.) Lay one of them at the back of the shelf. Place items on top and in front of the “riser” you just created for a tiered shelving unit. If your items are really small and your shelf is quite tall from shelf to shelf, you can stack two rows (or more) of boxes like stairs and get more riser-shelves out of one shelf! If your items are heavy, stuff the boxes with newspapers or old magazine pages for more support, or use wood blocks instead of boxes. Under shelf string or ribbon dispenser: Some batches of blank CDs come in a round plastic container with a screw-off base. These make perfect dispensers! Attach the base to the underside of a shelf or desk. Drill a hole(s) in the center of the top of the cover. 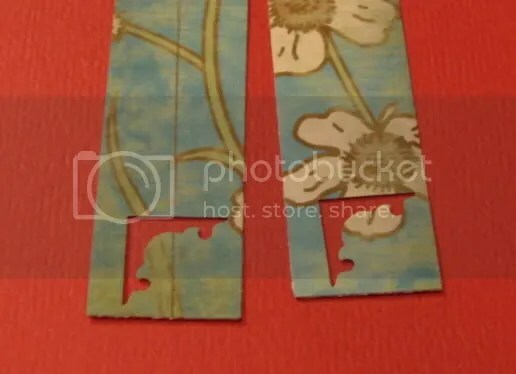 Place a spool (or several) of string/twine/ribbon inside the cover, thread the end(s) through the drilled hole(s) and screw it onto the base. Layout protectors: Save the 12×12 packaging from paper packs and chipboard. If there isn’t a hanging tab on the packaging, take a piece of packing/strapping tape that’s twice the length of the packaging and attach it to the end opposite the opening, folding it over to create a long tab. Use a three hole punch to punch holes in this new tab. Or tape the hanging tab to reinforce it and punch that. Storing your scrapbooking ideas and inspirations: Here’s how to make sturdy, matching hardcover idea books. Using an old book cut out several pages from the front, middle and end of the book. Cut out your ideas or picture inspirations and paste them onto the pages left in the book. The cut out pages should make enough space for the added paper so your book will still close well. Old Reader’s Digest books would make lovely ones. Your scrap ideas will look very neat and tidy and quite rich! Paint the spines and/or label them if you’re doing several books. Categorize them by topic and put the topic on the spine and/or the cover. Button bins: Old canisters or juice mix containers make great button bins, even if they aren’t clear. If you sort your buttons into colors, you can paint or paper the cans to match the color inside. 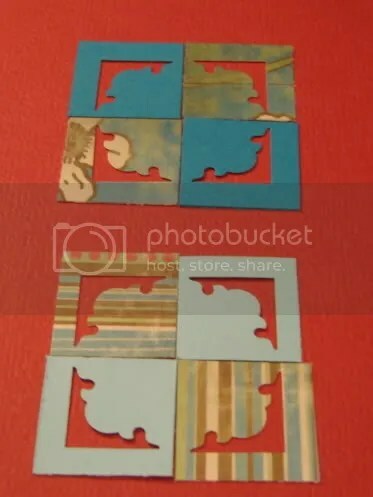 Using your scraps of paper to do this saves you cutting into new paper and makes a mosaic look on your cans. You can also stick a few buttons to the outside front of the can to remind you that it has buttons inside! 🙂 Do the same for ribbons or other embellishments. Storage for acrylic stamps: Store your acrylic stamps in old CD cases. 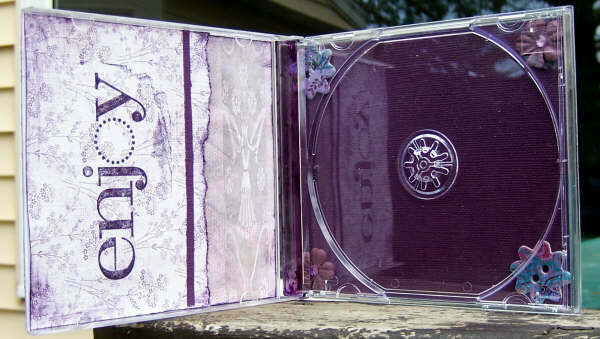 Remove the inserts from the cases that held the cd and attach your acrylic stamps to the inside of the cases. They stack well and travel well, now! And, you can label the edges or make your own covers for them. Trash bag holder: Saving all those groceries bags for your tape-up trash bags for scrapping? Attach an empty Kleenex box to the inside of a cupboard door or the underside of a table with heavy duty double sided tape. Fill the box loosely with the bags and now you have a dispenser for them! You could also reinforce the bottom of the box with an extra piece or two of cardboard and screw it to the table/shelf. I hope some or all of these ideas have helped you to dismantle that room full of time-bomb paper piles and miscellaneous hazards of who knows what, and that now you can find all your things in an instant! To top it off, you’ve also reduced your household waste. Enjoy your newfound clutter-free space. No, really. No thanks necessary. This little technique fell upon me kind of “by chance.” I feel it is worthy of sharing because of its simplicity and potential for multiple combinations. 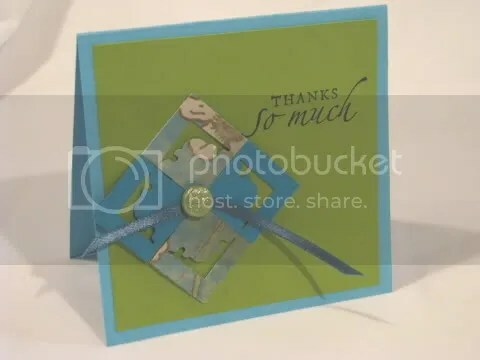 It easily can be used on a card or a LO, but the very best thing about this technique is its USE OF SCRAPS!!! 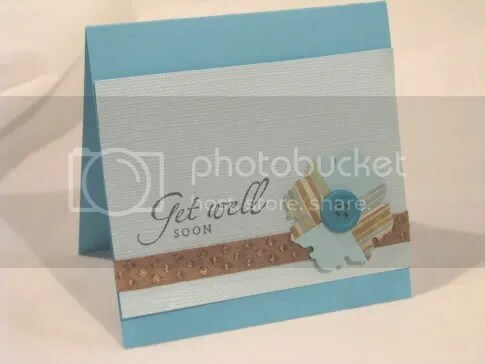 Using this technique, you could also make a lot of mini cards quickly without breaking into new stock or using up treasured embellishments. I hope you enjoy making these. 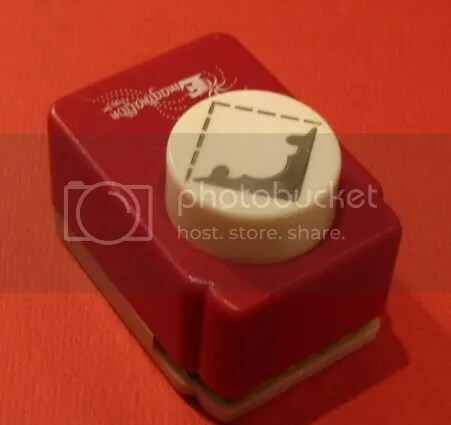 I realize not everyone is going to have this punch, but I’m sure any punch that is a photo corner punch will work for a totally different look. To join them, I cut another tiny piece of cardstock and attached it to all 4 squares. As I said earlier these would make quick invites, thank-you notes, a tag on a gift. Or, you could embellish a layout! Here are a couple of mini card examples. Hello everyone! I am here in Beautiful New Hampshire USA! I am on vacation..but I do have access to a lap top so without further ado…our winner is Ruby!!!! Congrats Ruby, please contact Nicole so she can send you a prize! Please Note: The administrative staff at SBCH have decided to change up the contests a bit for the blog, with that we will not be posting another sketch contest for a while, but stay tuned we will be posting other contests to challenge you in the near future! As well, make sure to keep checking out our awesome Technique and Scrapping Green articles. Have you ever considered what a “green” choice you make when you do your scrapbook supply shopping online at Scrapbooker’s Club House…? 3. At SBCH, you have the opportunity to order gift certificates or gifts online. Just ask Nicole (our store owner) how easy this can be! And “Bingo! !” There is no car travel needed to buy a special scrappy gift for someone. 6. Online at SBCH you can read product reviews from actual customers. This means that you can be assured of purchasing what you WANT and will be pleased. No more car trip(s) to the brick and mortar scrapbook store to return unsatisfactory items! Shopping online means comfort… what could beat shoppin’ and croppin’ in your jammies? You’ve beat the traffic and have not wasted your time travelling to a certain shopping destination… and you’ve avoided contributing to the pollution situation that we are now fighting in order to protect our earth, saving it for those who will come later. If we scrapbook to save precious memories, let’s try to be as green as we possibly can… because the people who come after us need a clean, green place to relax and look in wonder at the details created within the scrapbooks handed down from those who came before. Shop online, shop green and get right down to the business and joy of saving those precious memories for those who will come after us. Let’s leave them leafy trees, green grass, clean water and fresh air. Technique Tidbit Thursday – Buttons, Buttons, and More Buttons! Please note, this is an abridged version of a longer blog article by Ali MacDonald. I love to use buttons in a variety of ways on my layouts, cards and altered projects. I buy most of my buttons from a vintage clothing store where they’re removed from items of clothing too damaged to resell. I was always drawn to the larger buttons because of the visual impact they made, but I quickly learned that large buttons are not that useful on layouts! When choosing your buttons, pick out a variety of colours, shapes and sizes. Don’t buy too many large ones. 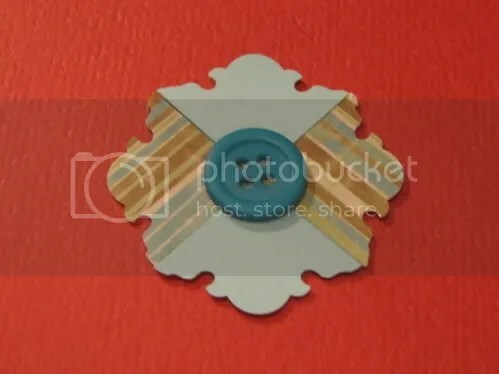 Smaller buttons are useful in creating the button clusters I have developed as part of my style, so I’m always sure to buy them when I see some I like. Tiny buttons are useful as well, so keep some in your stash. Shanks on the reverse of the buttons can easily be removed, no worries! 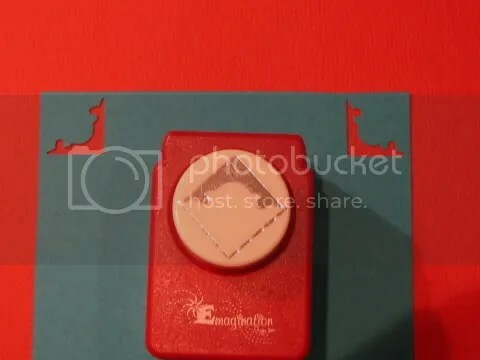 Clear buttons will allow the colour of your cardstock to show through and add dimension. 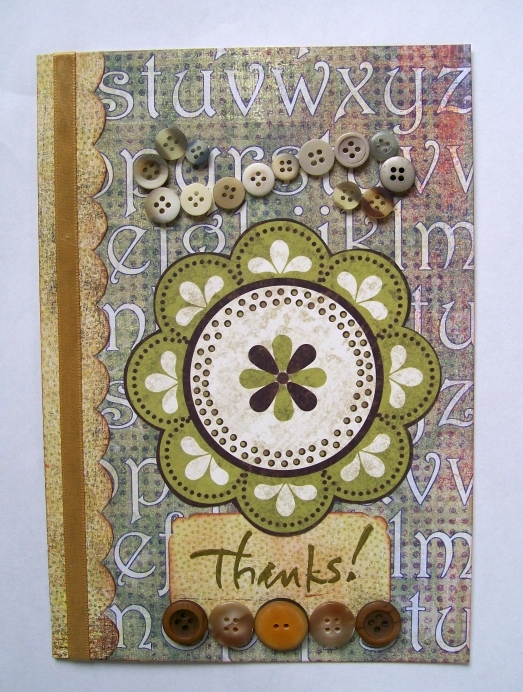 As seen in card below, neutral coloured buttons placed together can pack a visual punch. Buy large buttons in moderation! You can never have enough small buttons! Buttons with shanks are easy to adapt. Use a tool like this one to remove the shanks. It’s called a side-cutter. Use safety precautions when nipping off the shanks as it sometimes flies off with some velocity. Buttons can become flowers, balloons, snowmen, planets, and wheels. Great for creating kids’ layouts! A relaxed country look: run embroidery floss through the buttonholes, tie a tiny knot and leave the floss poking up. Frame a photo with buttons. It’s eye-catching. Vintage buttons used as accents look right at home on heritage-style layouts. 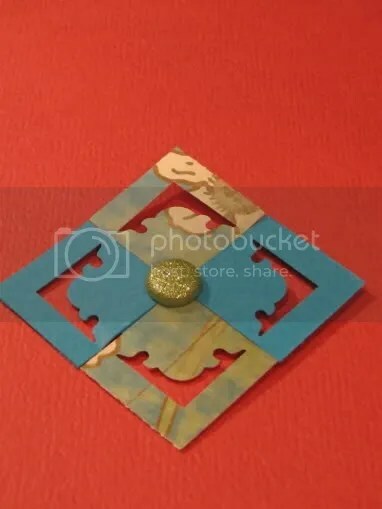 Use buttons on handmade cards to add a bit of flair. 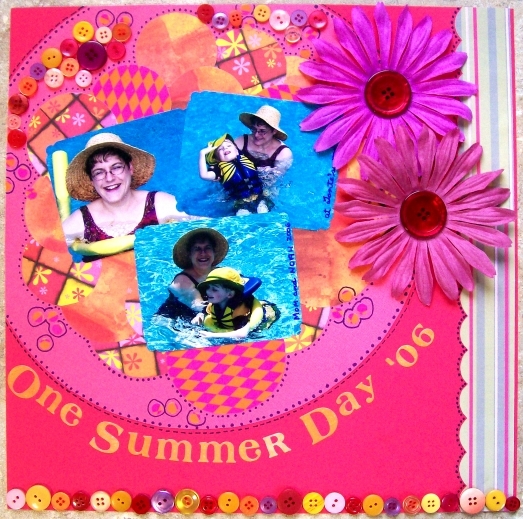 A button border makes a visually punched-up page accent as do the large buttons used as flower centres on this layout. Adding buttons to trees or vines as “fruit” or “blooms” will add an unexpected colour accent, as seen below. 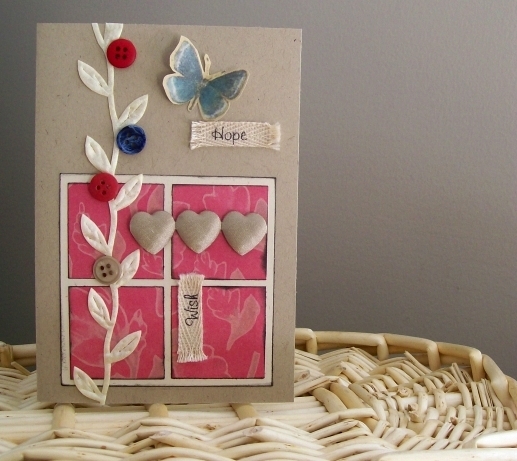 This card demonstrates how using buttons on handmade cards can add a bit of flair. 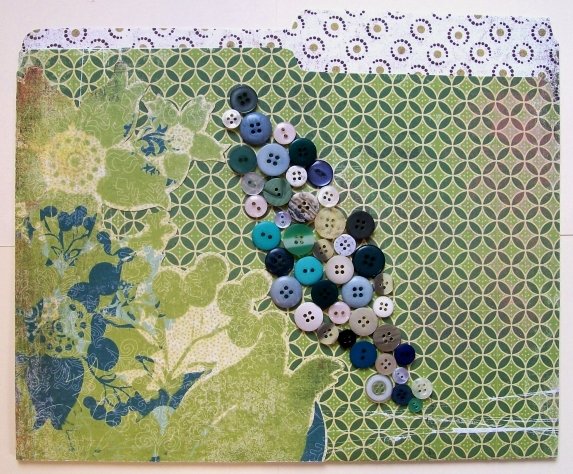 Button clusters are my ‘signature’ and I often use them on my creations. Fiddle with button placement to get just the right look. Remember that in the case of a cluster of buttons, the cluster is the embellishment, not the single buttons within it. Place your cluster on your LO, card or altered item where you feel an accent is needed. A button cluster will draw attention. Be sure the cluster complements the item and doesn’t overwhelm it! In the layout below, it’s easy to see how the cluster, made with mainly tiny buttons in tones of grey and black, draws the eye to the journaling. A bit of doodling around the buttons has the same effect. I bet your wheels are-a-turnin’ now!! What kind of a special “look” can YOU create with buttons the next time you scrap? 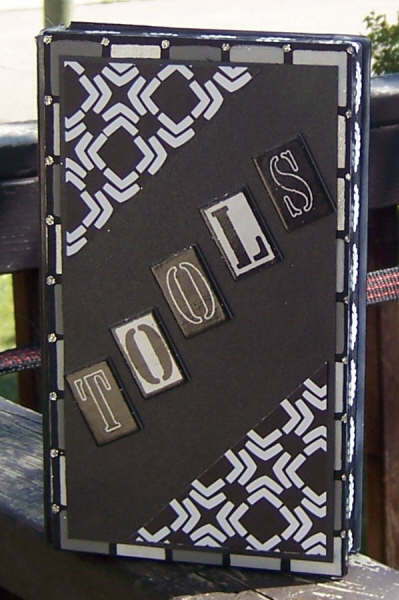 Have fun and be sure to share your creation with the gals over at Scrapbooker’s Club House. After all, sharing is what scrapbooking is all about. We all learn from one another! 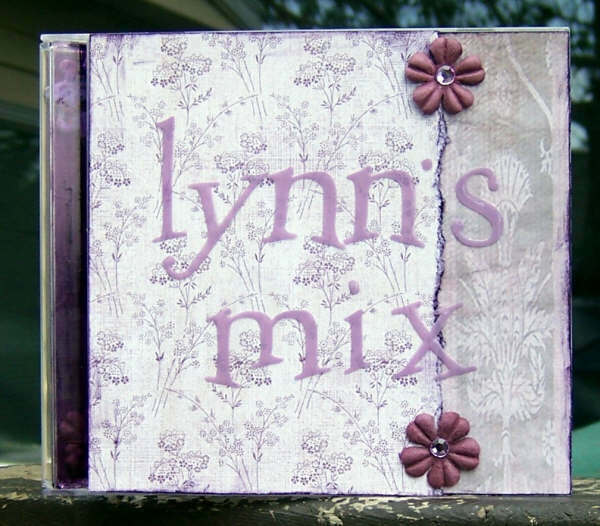 Good day everyone, and welcome to another Edition of “Scrappin’ Green!” In this edition, we feature Scrapbooker’s Club House member and one of our Design Team Members Lynn Marsh, who brings us some fun and inexpensive ideas for repurposing CD and Video Cases. Please pop in to Scrapbooker’s Club House anytime to share YOUR recycling/reusing projects with us. You’re ALWAYS welcome! Using items that you would have otherwise thrown away can both help the environment and save you money. It takes some imagination, but there are lots of things you can reuse in your scrapbooks or as aids to your scrapbook craft.I attend a lot of crops and classes at my local scrapbook store or have scrap time with friends and always have way too many things to go. Also, I’m usually left with very little work space, so conserving my space and less clutter is super important to me. As I was cleaning and organizing my television stand, I came across a whole lot of empty video cases and c.d. jewel cases. I was just going to toss them, when an idea came to me…. Why not make use of these. The vhs case is the perfect size for carrying my pens, paper piercer, exacto knife, markers, paint brushes, all those tools that we need at our finger tips. I don’t know about you, but when I carry those items in my scrap bag, I’m always stabbing myself or cutting myself on something, so I made a carrying case. Also, when I attend a crop, we are always asked to bring music. I like such a mixture of music that I usually bring a burned c.d. to the crop, but it’s always hard at the end of the crop to figure out which one belongs to you. Decorating the c.d. jewel case and clearly marking your name on it solves that problem. Remember, before you throw something away; make sure you really put some thought into just how you could repurpose it. I’ll bet you’ll be surprised at what you come up with. I know I was. I’m a Mom to 4 kiddos, sometimes guilty of the “That’s so cute, I’ll NEVER forget what he said about such and such” train of thought… only to forget it a few hours later when I go to tell my husband! When I go to scrapbook that fun kiddo page, the story remains… LOST. Does this scenario sound familiar? Never get caught this way again. 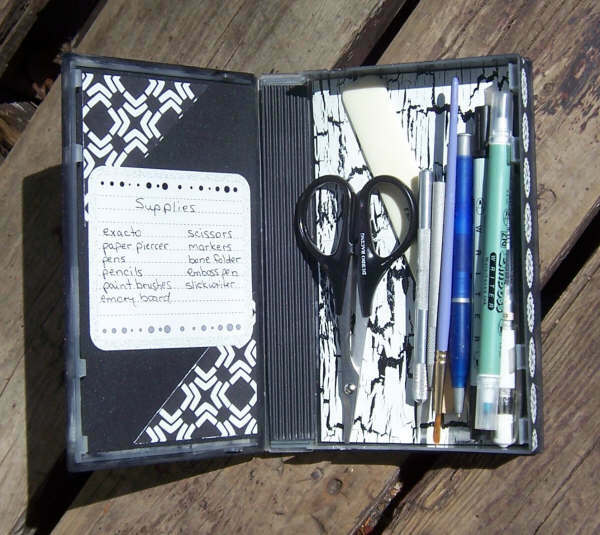 Here’s the easy strategy I use to maintain a “Journaling Box” chock full of tidbits and snippets of our life as a family of six. First, I bought a small plastic recipe box that included a set of alphabetized cardboard dividers. The box is made to hold 3×5″ index cards. These can be found at office supply stores, but are far less costly at dept. stores. Mine is super-basic and came from the Dollar Store. It has a flip-up lid that snaps shut. And-you guessed it, I also picked up a couple of packages of the lined 3×5″ cards. * I then used a white adhesive label snipped in half to cover each divider tab’s ABC lettering. *Next, I thought about the people and things I scrapped about and jotted a list. *Using my list, I wrote one category on the new label of each divider. *I left 3 of my labeled dividers blank for later category additions. As funny things happen or you have a thought or tidbit to save for later use, jot it down quickly on an index card. Use abbreviations you’re used to: this makes it faster. I’m a nurse so I use tons of abbreviations that make sense to me! Also note any ideas for certain photos you think would be appropriate to accompany this journaling. ALWAYS add a DATE to what you have written. Then, file the card under the most representative category. If it definitely does NOT fit into any existing category, you can make a new one using the 3 blank dividers you have at the ready. Do what makes sense to YOU. Your categories and the way you file things will be TOTALLY different from mine. That’s OK. Be sure your Journaling Box categories fit YOUR life and the people/things YOU scrap about. Once I use an idea from my journaling cards on a layout, I place a red checkmark next to the idea and slip the card into the “Done!” category found at the back of my recipe box. This step is necessary for me because it provides a satisfying visual recognition of the ideas I have journaled. If your recipe box becomes very full, you may want to start a new one. I have done this by dividing the topics and placing half in one box and half in another. It’s much easier to leaf through the journaling idea cards this way! I keep a few lined index cards in my purse and on my desk in the kitchen, & a small stack of them right next to my journaling box in my office/scrap room. I have also been known to use bits of scrap paper, the backs of envelopes and yes, those old faithful sticky notes to write my little journaling tidbits on. I file them that way, too, because there’s no time for recopying. Not everything is on an index card, by any means: it doesn’t have to be beautiful to be filed! The main goal is to safeguard the moments that mean something to you or to those you care about. If you find a funny tidbit written on a gum wrapper in your Journaling Box, and it contributes to a page that sparks memories for those you love, then the system worked. Bravo! !